early months of the year. The beech is a native tree and is relatively easy to identify all year around owing to its smooth bark. There really is no other tree with a bark like its, which is vaguely skin like. The examples, on this site, are quite young; it is capable of growing twice this high to about forty metres, nevertheless they represent the species quite well in that they are the right shape, are mature enough and generally in good health. Other factors in identifying the beech are its leaves which are very thin, but robust; kind of like grease paper in texture. The nuts are also interesting, they are hairy and look as though they are half open; a bit like cockles. They are known as capules. 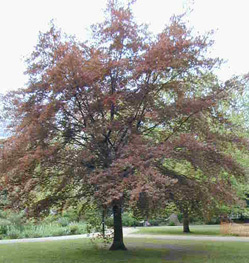 A copper beech in Russell Square. alternate; veins: alternate; oval with a point; very thin. paper like. nuts/fruit: fairly small brown nutlets; look vaguely crablike. general: quite common in London and elsewhere. Cheapside and New Change, there are two.